A doughnut, or donut, is a deep-fried piece of dough or batter. The two most common types are the torus-shaped ring doughnut, and the filled doughnut, a flattened sphere which is injected with jam/jelly or another sweet filling. A small piece of dough, roughly the size of the middle of a ring doughnut can be cooked as a doughnut hole (timbit). Doughnuts can be made using a yeast-based dough (raised doughnuts), or a special type of cake batter. Yeast-raised doughnuts contain about 25% oil by weight, whereas cake doughnuts' oil content is around 20%, but cake doughnuts have extra fat included in the batter, before frying. Cake doughnuts are fried for about 90 seconds, turning once, at between 190 and 198 degrees Celsius. Yeast-raised doughnuts take longer to fry, about 150 seconds, at 182 to 190 degrees Celsius. Cake doughnuts typically weigh between 24 g and 28 g, whereas yeast-raised doughnuts average 38g but are generally larger (when finished) and may be less dense. After being fried, ring doughnuts are often topped with a glaze icing or a powder such as cinnamon or sugar. Ringless doughnuts may be glazed and injected with jam or custard. There are many other specialized doughnut shapes such as bear claws, old-fashioneds, bars (a rectangular shape), and twists (where the dough is twisted around itself before cooking). Doughnut holes are small spheres that are made out of the dough taken from the center of ring doughnuts. There are lower-fat recipes for doughnuts which specify baking rather than frying. Application of fat to the pastry during baking can make it difficult to distinguish the final product from a fried doughnut. Doughnuts have become a part of North American popular culture. The cartoon character Homer Simpson is especially fond of doughnuts, while popular mythology has American police officers addicted to them. 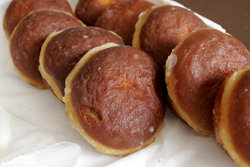 Cake-based doughnuts dominate commercial production for packaged sales in grocery and convenience stores - for example "little powdered doughnuts". Yeast-based doughnuts dominate commercial production for fresh retail sale. There are retail stores which specialize in the selling of fresh doughnuts and coffee to customers, such as Dunkin' Donuts, Tim Hortons, Winchell's Donuts, Country Style and many other chain stores. Krispy Kreme is distinguished by having neon signs, known as "hot lights", to inform customers when hot doughnuts are available - fresh off the assembly line. Many doughnut shops are open 24 hours a day. Doughnuts have a disputed history. One perspective is that they were introduced into North America by Dutch settlers, who are responsible for popularizing other desserts, including cookies, cream pie, and cobbler. Another story credits the invention of the doughnut hole to a Danish sea captain named Hanson Gregory. During a particularly violent storm, Gregory needed both hands free to man the wheel of his ship, and impaled a fried cake upon the wheel, creating the signature hole. The center of fried cakes were notorious for being undercooked, so the innovation stuck. By cooking fried cakes with the center hole, the surface area increased, and the doughnut cooked faster. Before the ring shape became common, doughnuts were often made as twisted ropes of dough. When placed into a pot of boiling fat, they floated until the lower half was cooked, then rolled themselves over to cook the other side. Ring doughnuts have to be flipped over by hand, which was more time-consuming. The twisted-rope type is called a cruller in some parts of the U.S., but cruller also refers to a particularly airy type of ring doughnut, usually glazed. Washington Irving's reference to "doughnuts" in 1809 in his History of New York is believed to be the first known printed use of the word. "Doughnut" is the more traditional spelling, and still dominates outside the US. At present, "donut" and "doughnut" are both pervasive in American English, but only "doughnut" is listed in Thorndike and Lorge's (1942) "The Teacher's Word Book of 30,000 Words." It is unclear when the "donut" spelling first took hold, but frequently it is attributed to Dunkin' Donuts, which was founded in 1950. To the contrary, Mayflower Donuts pre-dated Dunkin' Donuts, and there are sparse instances of the "donut" variation prior to WWII. For instance, it is mentioned in an LA times article dated August 10, 1929. There, Bailey Millard complains about the decline of spelling, and that he "can't swallow the "wel-dun donut' nor the ever so 'gud bred'." In the Netherlands, the Oliebollen, referred to in cookbooks as Dutch Doughnuts, contain pieces of apple and/or dried fruit like raisins, and are traditionally eaten as part of New Year celebrations. In Poland the round, jam-filled doughnuts eaten especially - though not exclusively - during the Carnival are called pÄ…czki. Jelly doughnuts, known as Sufganiot in Israel, have become a traditional Hanukkah food in the recent era, as they are cooked in oil, associated with the holiday account of the miracle of the oil. In France and in New Orleans, Louisiana, there is a fried pastry called a beignet which is sometimes described as a French doughnut. In Germany, the doughnut equivalents are called Bismarcks or Berliners. These don't have the typical ring shape, but instead are solid, usually filled with jam. Bismarcks and Berlin doughnuts are also found in the U.S. This type of doughnut is popular in Chile because of the large German community there, and is called a Berlin (plural Berlines). It may be filled with jam or with manjar, the Chilean version of dulce de leche. Italian doughnuts are called zeppole. Some savory fried items not based on wheat-flour pastry are referred to as doughnuts, such as the ring-shaped Indian vadas, made of lentils. Doughnuts, as ring-shaped items, are an important explanatory tool in the science of topology where the ring doughnut shape (a ring with a circular cross-section) is called a torus or toroid, and an example of using the ring doughnut as an illustrative term can be found in popular explanations of the PoincarÃ© conjecture. The other toroidal food item used in topological explanations is the bagel. However, the bagel has a hole to allow it to be retrieved from boiling water, while a doughnut hole is intended to allow the doughnut to cook faster and more thoroughly. There is no historical connection between bagels and doughnuts. By analogy, donut is a slang term for a circular maneuver made with an automobile or other vehicle from a sharp turn in which the rear of the vehicle swings around to form a larger circle as the front of the vehicle turns in a tight circular motion. The slang term doughnut is also used to describe the small rigid spare tire that comes as original equipment with many new cars.